Congrats to Through the Haze! "Crowned the Fastest-Growing Company in the United States in both 2010 and 2009 by the American Business Awards, iolo technologies, LLC (www.iolo.com) produces award-winning software that repairs, optimizes, and protects Windows computers. These products speed up old – and new – computers, as well as extend the overall life of the family’s PC. And that saves money – something, I think, any dad would like. Computer slowdowns resulting from age and use can be easily reversed with some registry fixes, start-up programs removal, memory and hard drive defragmentation etc. That’s where programs like iolo’s System Mechanic come in. System Mechanic, the #1 best-selling PC performance software, helps millions of computer users get the maximum performance out of their PCs without breaking the bank. System Mechanic has 51 different tools and patented proactive maintenance technology that can fix, maintain and speed up your PC so its runs like new forever – all while busy moms and dads are fixing dinner or playing with their kids. The world's best-selling tune-up software gives you the safest, most complete suite of performance tools available. No need to be an expert - it's easy!" What we thought: My laptop is relatively new, Dec 2010, but it does seem to run a little faster with iolo System Mechanic. Installation was super easy and I haven't had any issues with viruses since. I like knowing my computer is being properly maintained without much effort on my part. This software would be a great Father's Day gift idea for the computer-loving dad! ABCD Diaries gives iolo System Mechanic an A+! 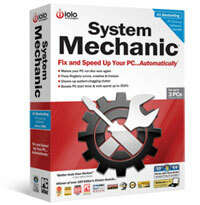 Buy It: Find this awesome software at computer stores nationwide or online at iolo System Mechanic! Win It: iolo has generously offered one ABCD Diaries reader a copy of iolo System Mechanic! To enter, follow our blog via GFC. Disclosure: ABCD Diaries was given a copy of iolo System Mechanic for review purposes only. We were in no other way compensated. The opinions expressed in this post are ours and ours alone. Following you on Google Friend Connect as "Doc Holliday"
I entered Insta Slim shirt. I entered the Tiger Balm giveaway. I entered the KIWI giveaway. entered Blog Bash Giveaway 1: Rowenta Iron Giveaway!! entered Blog Bash Giveaway 2: Thompson's Water Seal Deck Kit!! entered Blog Bash Giveaway 3: Ancestry.com World Membership!! entered Blog Bash Giveaway 4: Educational Insights Prize Pack! !